Two years ago, the U.S. reached a quiet tipping point in the modernization of its power grid: The number of electric meters with two-way communications surpassed the number of older models on the grid. Pacific Gas & Electric is developing a pilot program that would do just that, working with Natural Resources Defense Council (NRDC) and The Utility Reform Network. Using the open-source CalTRACK/Open EE meter and measurement system, the parties want to create a two-year pilot that would engage with third-party aggregators of energy efficiency products, paying for actual results rather than using up-front rebates tied to expected savings. What they are proposing isn’t so much an energy efficiency program as a new market construct. By leveraging the measurement capability of AMIs, efficiency can become a tradeable resource in financial markets, allowing projects to self-finance or secure investment dollars through securitization. Pay-for-performance is not an entirely new idea for efficiency, but the proliferation of advanced metering has now made it viable on the residential scale. PG&E already has its Commercial Whole Building Program, which ties post-installation rebates to a performance-based bonus based on actual meter data. The program, open to owners and long-term lessees of commercial building, targets 15% savings and boosts total incentives to 60% of total project costs as opposed to 50% in other programs. Earlier this year, the utility had 14 projects enrolled in the pilot, including an office, grocery and institutional properties, ranging between 20,000 and 100,000 square feet. Results of the project are expected next year. But the third-party residential model being proposed now is different: Not only does it remove the utility from the equation, moving further towards the platform-provider model, but it also focuses on creating market constructs rather than energy solutions. “Getting paid based on meter performance aligns interests,” Golden said. Few question whether energy efficiency measures work generally, but determining actual energy savings has been a barrier to commercializing the resource. California and a handful of other states have spent billions of dollars on smart meters, and can now begin to attach reliable values to efficiency enhancements. If the third-party pilot is successful in California, other states with high penetration of AMI could follow suit. 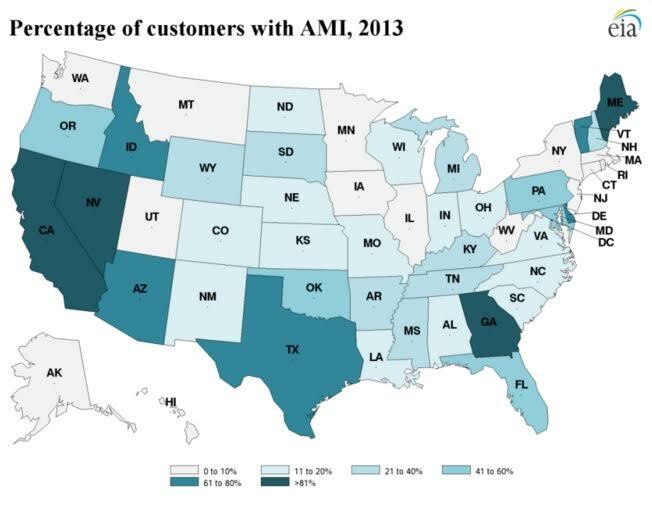 According to the EIA, five states have AMI penetration levels above 80%, with the highest concentrations in Texas, Georgia and New England. 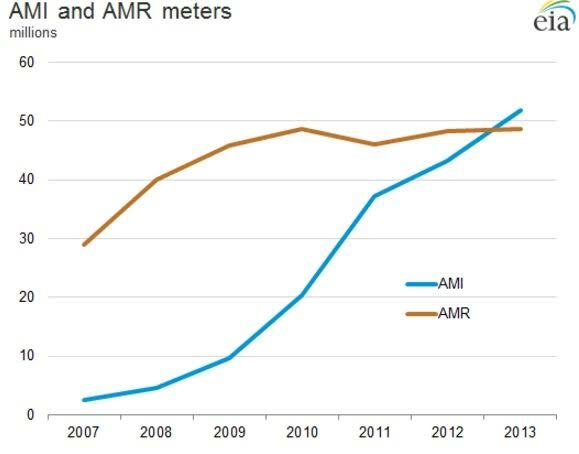 And the shift is occurring rapidly – California added the most AMI meters of any state in 2013, with about 1.8 million new meters. Pacific Gas & Electric has about 9 million smart meters deployed in total, both electric and gas, to more than 6 million customers. For the utility industry, the shift would effectively eliminate one of the existential questions that has plagued executives: How do they continue to make money? By tasking third parties with developing, marketing and installing energy efficiency, “you don’t have to design business models anymore,” Golden said. The incentives would be paid to aggregators responsible for the performance of a portfolio of projects, which could include finance providers, a large contractor or a coalition of smaller contractors. NRDC stressed that the incentive payments should be made on a portfolio of projects to ensure the statistical significance of the savings and to manage the performance risk. California has some of the most aggressive building standards in the country, and along with a 50% renewable standard, it is attempting to double the efficiency of commercial buildings. Efficiency is one of the biggest energy saving opportunities in the state, according to Lara Ettenson, who directs NRDC’s California energy efficiency policy. “There is a lot of efficiency we can gain in commercial buildings, in public buildings, and to get at it we will need some policy changes,” said Ettenson, who earlier this year authored a report on California’s efficiency challenges. Faulty assumptions underlying efficiency programs are leaving efficiency on the table, she said, but policy changes could help unlock those savings. And the state has a ways to go: NRDC estimated California will need to save a cumulative 93,000 GWh over the next 15 years. Making energy efficiency a profitable, reliable investment could help access those savings. “We’re getting close to having an additional cashflow stream which helps orient the marketplace somewhat towards the social goal we’re all looking for, but doesn’t create so many barriers it slows down the marketplace,” said Golden.